Contrary to popular belief, the dental implants actually aren’t the tooth or teeth themselves, rather, they’re the posts or frames placed into the jawbones, just right beneath your gums. It is to these posts or frames that either an individual tooth, implant-supported bridge or dentures are mounted on. While expensive, dental implants make up for the premium cost by providing the most stable support for your artificial teeth. This means that, regardless of whether it’s a denture, a dental bridge, or an artificial tooth, you can be sure that it won’t slip or shift in any way inside your mouth. The secure fit is a welcome benefit that anyone who’s ever had a denture slip by accident knows is well worth the cost. More than saving yourself from an embarrassing situation, however, dental implants also help ensure that that the bridges or dentures placed on top feel more comfortable and natural. Also, being that not everyone can have ordinary bridges or dentures due to certain reasons, like sore sports or gagging, dental implants present a potential alternative. To receive implants, it is important to have healthy gums and the necessary bone to help support the implant. You also need to make sure that you’re willing to make the necessary sacrifices. Getting an implant means you’ll have to be very meticulous with your oral hygiene. Not only that, but regular dental visits are mandatory as well. If you don’t do that, there’s a huge chance your implants may fail, and you definitely don’t want that to happen. Implants are the most expensive method of tooth replacement so far. What’s even worse is that they’re not covered by most insurance companies. Even if they do, seldom is it that more than 10 percent of the cost covered. 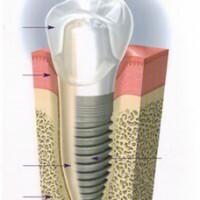 Natural feel – As mentioned earlier, implants feel more like your natural teeth. This is because they are embedded directly into your bones, which makes them very stable. Comfort and Convenience – With implants, you no longer have to worry about using denture adhesives or your dentures slipping, clicking or even falling out whenever you speak or eat. Taste – It’s not uncommon for people with dentures to completely change their diet because they don’t fit perfectly. Also, upper dentures affect your sense of taste because they cover much of your upper palate. With implants, you don’t have to worry about all of that. Self-esteem – Because of their better and more stable fit, you don’t need to worry about your implants as much. This is huge for your self-esteem as you don’t have to think about people noticing that you have dentures or missing teeth anymore. Also, implants don’t affect your speech like dentures do, which should only make you feel much more confident when speaking. If you’re seriously considering implants, don’t forget that good oral health habits are key for it to be a success. Ideally, you’ll also want your dentist’s office to be just an hour’s drive away to make it easier for your regular checkups and cleaning.